LAKEWOOD, CA--(Marketwired - Apr 6, 2015) - The Model Grand Opening for William Lyon Homes' new Canvas attached-home neighborhood is happening this Saturday, April 11th, giving excited homebuyers their first opportunity to tour the professionally decorated models and experience the attainable lifestyle all of Lakewood is buzzing about. Those interested are encouraged to bring family and friends along as they explore the modern townhome designs and contemporary architecture that make this collection a must-see. Visit the Sales Gallery this Saturday for model tours, or log on to www.LyonCanvas.com for immediate details. "Seeing these beautiful new model homes up close is an essential first step for buyers," said Lesley Pennington, Vice President of Sales for William Lyon Homes. "In-person tours give you an opportunity to explore the floorplan that fits your lifestyle, meets your budget and connects with your individual needs. It's the best way to find the ideal home for you." 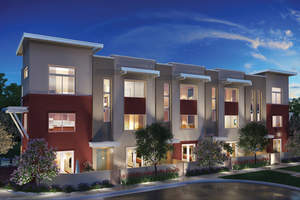 Canvas' innovative 3-story townhomes span from approximately 1,647 to 1,801 square feet, with 2 to 3 bedrooms, 2 full baths and 2 powder baths, bonus rooms and 2-car garages. Buyers will also value the confidence and quality attached to any new construction by William Lyon Homes. Prices start from the low $400,000s. Located adjacent to Long Beach, residents enjoy a convenient setting near Davenport Park, Lakewood Country Club, Lakewood Golf Course, Mayfair Park and Pool and several other recreational destinations. Shopping, dining and entertainment can be found at the nearby Lakewood Center with its Costco, Best Buy, Macy's and Target, and at the Long Beach Towne Center's outdoor promenade, theater, restaurants and shops. Other attractions include Downtown Long Beach, The Pike at Rainbow Harbor, Belmont Shores and the Aquarium of the Pacific. Medical services are accessible at Lakewood Regional Medical Center. Don't miss out on Canvas' Model Debut this Saturday, April 11th in Lakewood.